On the morning of Dec. 1, NFL commissioner Roger Goodell received an unfathomable phone call from the league's head of security. Jovan Belcher, a fourth-year linebacker for the Kansas City Chiefs, had killed his girlfriend in their home, then driven to the team's practice complex. There, despite the pleadings of his coach and general manager, he shot himself in the parking lot, leaving his 3-month-old daughter an orphan. Goodell recalls his disbelief. "My first thoughts weren't about football at all," he told TIME. "This is not a football tragedy. It's a human tragedy that impacts families, loved ones and an innocent child left behind." He arranged for grief counselors in Kansas City. He spoke to Chiefs chairman Clark Hunt several times that day, encouraging him to consult the team's captains: Should the players take the field against the Carolina Panthers at home the next day? Many fans expected and wanted the NFL to at least postpone the game. How could anyone--especially coach Romeo Crennel, scarred by what he saw--focus on football? 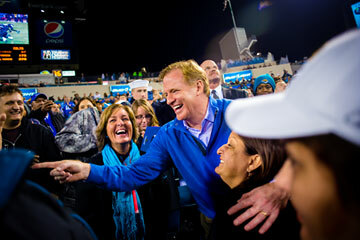 Goodell spoke with players'-union boss DeMaurice Smith and others. "It was ultimately my decision," says Goodell. "But it was important to get the views of the players and try to honor their wishes. Clark got back to me and said Romeo and the captains felt that playing the game--being together as a team and a community--was important. So that's exactly what we did." Kansas City delivered an emotional 27-21 victory. For the fourth time in eight months, a current or former NFL player had taken his life. There's no evidence indicating that football had anything to do with the Belcher tragedy. The Chiefs say Belcher had no "long concussion history." He reportedly was drinking the night before the murder-suicide, and Belcher's relationship with his girlfriend Kasandra Perkins had apparently had troubles. But here's the tabloid reality facing Goodell's NFL: given all the news about retired NFL players suffering from mental illness or killing themselves while coping with brain damage associated with head trauma from playing football, it is natural to wonder, What if? The Belcher tragedy may be another warning sign: Are the pressures of pro football worth our cheers? Some real science underscores this dark side of the game: on Dec. 3, a new study from Boston University detailed 33 cases of chronic traumatic encephalopathy (CTE)--15 of them previously unpublicized--in deceased ex--NFL players. (CTE, a debilitating brain disease associated with head trauma, can be diagnosed only postmortem.) Under the weight of such research, Goodell is trying to pull off, in his words, a "balancing act" that will define his legacy. Can he preserve the core of a game that is our national obsession--and a hugely profitable business--while responsibly addressing the mounting evidence that the sport can shatter lives?